Sesame oil and olive oil each have about the same number of calories -- 120 per tablespoon -- and they are both loaded with healthy fats. But they do have different flavor profiles, which can change the outcome of your entree. Sesame oil has an earthy, nutty flavor, while olive oil is somewhat buttery. 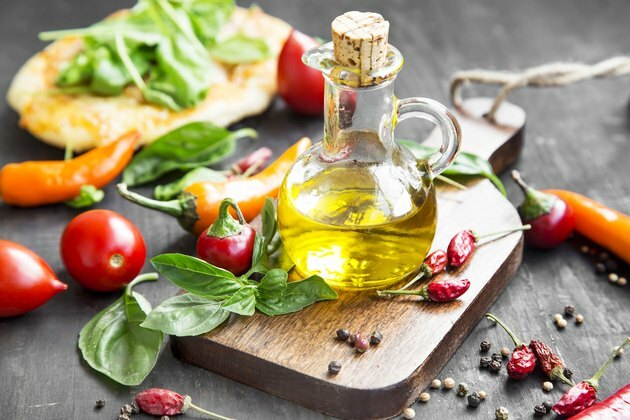 If you want to get more vitamins and minerals out of your dish, though, olive oil is a better option because it has higher levels of these nutrients. Both sesame oil and olive oil are full of good fats. Almost 85 percent of the total 13.5 grams of fat in a tablespoon of each oil is monounsaturated and polyunsaturated -- MUFA and PUFA for short. These fats lower your total cholesterol levels, over time, thus decreasing your chances of suffering from cardiovascular disease and stroke. Sesame oil has a nearly even amount of mono- and polyunsaturated fat, offering roughly 5.5 grams of each per tablespoon. Olive oil is much higher in monounsaturated fat than polyunsaturated fat. You’ll get almost 10 grams of MUFAs and about 1.5 grams of PUFAs from a tablespoon of olive oil. One fat is not necessarily better than the other, though. As long as you’re getting more MUFAs and PUFAs than saturated and trans fats, you’ll be protecting your heart. Olive oil is higher in vitamin E than sesame oil. Vitamin E is one of several types of antioxidants -- substances that get rid of free radicals in your body by making them neutral elements. Otherwise, free radicals roam around and stick to healthy cells, and this is often a precursor to developing cancer, heart disease and other chronic diseases. For optimal cell protection, you should be getting 15 milligrams of vitamin E daily, according to the Food and Nutrition Board of the Institute of Medicine. One tablespoon of sesame oil has less than 0.2 milligram. But the same amount of olive oil gives you almost 2 milligrams, or roughly 13 percent of your daily needs. Every time you have an injury anywhere in your body, it’s vitamin K that steps in and helps with coagulation. The vitamin stops the bleeding and forms scabs, if need be. Your vitamin K recommendation depends on your gender, with men requiring 120 micrograms daily and women needing 90 micrograms every day. Sesame oil provides fewer than 2 micrograms of vitamin K per tablespoon, but you’ll get more than 8 micrograms of vitamin K from 1 tablespoon of olive oil. That's 7 percent of the bodily needs for men and 9 percent for women. Sesame oil isn’t a source of any kinds of minerals. Olive oil does have several types of minerals, although you’ll only get a trace amount of each of them. You’ll get a small dose of the electrolytes sodium and potassium, which both help with heart and muscle functions. Olive oil also provides a bit of iron, a mineral that delivers oxygen to cells, as well as calcium, to add to your sturdy bone structure. None of these should be considered a significant contribution to your recommended dietary allowance, however, but rather a small nutritional bonus.